Easter Card: Offer humanity, warm food and essential clothing! Provides a full meal per week for 2 people living below the poverty line. Provides a full meal per week & personal hygiene items for 4 people living belowthe poverty line. Provides a family basket with supplies for 1 month including groceries, personalhygiene items, baby foods for a family with young children. Select the amount you wish to donate through Pay Pal. 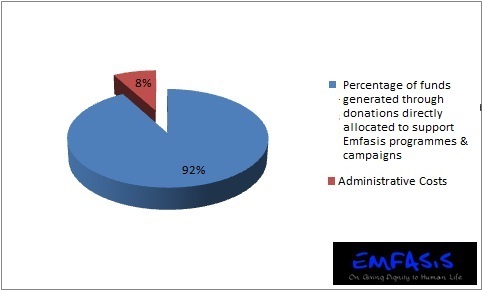 As soon as you fill out your details and you complete your donation, you automatically become a member of our virtual family of EMFASIS supporter. Complete coverage of transportation fees and mobile phone communications with the organization and the various emergency services, during the annual relief efforts. Such donation provides 2 necessary tools for the direct relief of the homeless/people in need under unforeseen and adverse conditions. Covering transportation, communications and the participation of the streetworker in monthly field safety & streetwork training. When you sponsor a volunteer, you present the volunteer with a holistic offering which takes care of transportation, communication fees, and a complete training cycle for vocational and soft skills, enabling him to acquire the necessary tools to excel in both his volunteering as well as his professional capacities. Use the following details to make donations via bank transfers.